At first you would think that these are pictures of pieces of junk. But they are pieces of art done by the Argorn Studio situated at Trellis Bay, Beef Island, BVI. It is an Caribbean arts and crafts center offering, T-shirts, original metal sculptures, pottery, handmade baskets and calabash bowls. They also have various craft workshops. party. This venue (Trellis Bay) has gotten quite popular over the past few years. They also ke ep a Old Years Party. There is normally a live local band and Moko Jumbies to entertain the crowd. The structures are firmly positioned in the sea, near to shore. The first one that was positioned was the ball. In th ose days, the full moon party was mostly attended by the tourists who had their yachts anchored nearby. As the party grew in popularity, more local residents now attend these parties on a regular basis. The name of this fruit is Five Fingers. A friend of ours has a beautiful garden with a variety of trees: Mango, Golden Apple, Five Fingers, Coconut, Bananas and others. Occasionally he would call us over to pick some of the fruits. One day we went to pick some coconuts and I saw my husband walking up the hill eating this fruit - Five Figures. I was amazed because I know this fruit to be typically very acid. He just took a large bite of the fruit. I could not understand it. To top it off, he asked me if I wanted a bite. Definitely No!!!! But as he was eating, I would see the juices falling from his mouth. I did eventually take a small bite with the expectation that it would be acid and I was greatly surprised. Boy was it sweet - real sweet!!!! When we get the opportunity to pick some of this fruit, I cut them horizontly and the cuts look like stars. I pack these 'stars' for a snack at work. My first posting for today is to give thanks. I have another website, about What To Cook, and I said to myself one that I am really having fun taking pictures for my site. I would like to have another website about my passion on photography. But I had to save enough money to purchase the domain, hosting etc. One day I was going through the Ad Sense website and I realized that blogger.com is part of their program. Then I got an inspiration that I can develop my website/blog about my pictures PLUS it is free! Therefore I could put my dream into gear - no excuses! For the few days since I started adding pictures to my blog, I am having fun and feeling good about it. I even have another idea to develop another blog on beautiful hair. Developing this blog is so easy, I like the fact that I can up load my pictures of any size. I once was a member of a program where you can upload your pictures and get paid if anyone purchases your pictures. On two occasions, my payment arrived late and within that time, my images were deleted. On the last occassion, I was most annoyed and never continued using their service. In addition, the pictures had to be of a particular size AND no one purchased my pictures. Today I did some prep work for three pages of my website and everything went well. I cooked the dishes and took pictures each step of the way. The following pictures are of paintings that are done by local artist on a long concrete wall. 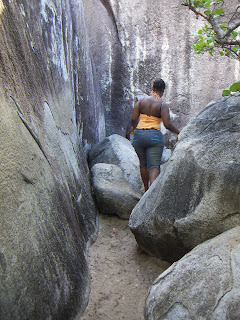 The location of this wall is at Belle Vue, Tortola BVI. During our cruise ship season, this is one of the stops the tour guides take their visitors to. This is a must see for our visitors. The portraits are of historical cultures and lifestyles. This water fountain was installed whenof the parks in town was renovated. I really like this creation - making this water fountain out of fine stone. It is really a master piece. 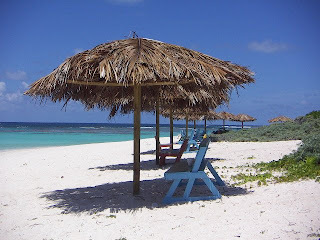 For my son's birthday he decided to visit Anegada, British Virgin Islands, so as it was a working day, I took the day off and made the trip with him as I wanted to visit this island for quite some time. We had to take a ferry from the main land (Tortola) to get to Anegada. island. As I looked closely, I saw some electricity poles and realized that the island was really absolutely flat. As usual I was taking all the pictures, only to realize that none was taken of me. My husband and I got married in January 2007 and about two weeks later we decided to take the bridemaids and groomsmen (all of whom were my husbands relatives) on a sailing trip for the day. My husband has a large family so we ha d to charter two catamarans for the trip. My son (in the image on the left) made all the arrangements and he sailed one of the boats while my nephew-in-law the other. I was so proud of my son. Our trip took us to Jos Van Dyke, British Virgin Islands. As you will see his back is to me as I took the picture. This was his doing. He did not want me to take the picture so he turned away from me. I took the picture anyway. As we docked, everyone was swimming and having a good time. The water was seven (7) ft deep. I can swim but I am very fearful so while everyone was swimming and having a good, I was taking all the good shots. As you will notice the water is absolutely beautiful in the BVI. 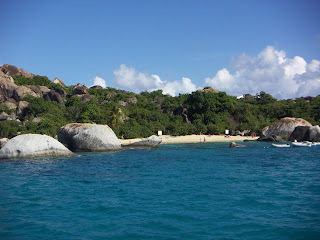 On my first sailing trip we went to Virgin Gorda, BVI. The topography consists of alot of huge rocks. In the image to the left, is my daughter now beginning her trip on a trail to The Baths. It is a very popular spot in Virgin G orda. You can't leave the islands without making a stop there. My son gave me a digital camera for my christmas in 2005. I had a facination with cruise ships so I began taking pictures of the cruise ships every available opportunity. I worked at an automobile company that was located on the coast line. Every morning and evening during our cruise ship season, which runs from April to October, I would see cruise ships cruise into and depart our port. On many occasion I would say “I must go on a cruise before I die.” Many people heard me saying that. I was in awe to see these magnificent ships cruise into our territory. May times my co-worker would call out to me just to see the ships sailing by. I did not put much thought into going on a cruise until in 2006 I was involved in a business opportunity and they had a site that allowed its members to go on cruises at reasonable prices. When I saw their prices, I realized that I could do this. I put my plans into gear. In September 2006, my husband and I were on our way to our first cruise, in the Caribbean, for five days. It was a life time experience . This pic is of my husband on the deck of the magnificant ship "Carnival Destiny". It really was an awsome experience. The day was a bit overcast but the picture ca me out pretty good. 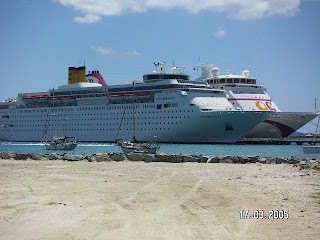 The next picture was taken at the cruise ship dock in Barbados. I took this picture of the sunset on our last day of the cruise. We were sailing back t o Puerto Rico. One beautiful morning as I was driving to work, I saw this beautiful sunrise. It was just magnificent. I just had to stop and take a photograph of this scene. I had just gotten my new blackberry cell phone and I was anxious to see it take good pictures. This was my opportunity. It past my test. I just wanted to make the moment last forever. 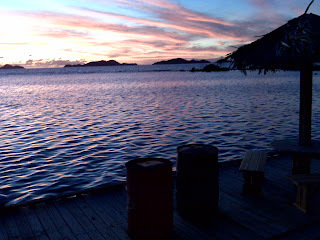 Location: by Fat Hogs Bob Restaurant, Hodges Creek BVI. This restaurant has recently changed management and is called Pussers. 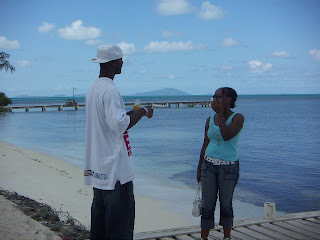 For my anniversary this year (January 14th 2009), I wanted to visit this small island (part of the BVI). It is called Sabarock. What you see in the image is the width of the island. It is not very long either. Unfortunately my husband was not able to make the trip with me so I insisted that I go by myself. I had to take two ferry to get to my destinations . The water is so beautiful and it was a fantastic day. This image is of a lovely spot at the back of the restaurant/hotel. One disappointment I had though, was what I had for lunch. I wanted a meal with some lobster and maybe vegetagles but they were only offering tortillas. Most of the restaurtants in the BVI offer a light meal for lunch - they mostly cater for the tourists. You are probably wonderng if I have a things for goats. Not really, but I have never seen a goat so large. I took this picture in 1986 when my husband and went Virgin Gorda, British Virgin Islands (BVI) for the day. I was so fascinated with the animal's size that I had to take his picture. He was chilling out in the shade with his pals. My first photo is one that I took of some goats (young ones) they are so cute and they are wild. I was taking a drive up the hills of Paraquita Bay, British Virgin Islands, and I saw them just chilling. Their mother was no way in sight. I thought if I approached them they would have ran away but they did not. So I was able to take a few 'shots' and close up too.